Its early morning and I can hear the eerie call of jackals piercing my sleep. Before I open my eyes, I am aware of the fact that I am luxuriously cocooned in a huge bed, in sheets with the kind of thread count that should be mandated by law. Curiosity tugs me away from this comfort and I open the door to crisp air smelling of dry grass and late season bushveld. The sound of morning doves fills the air. I climb the wooden stairs to a solidly built viewing deck outside my room to see if I can find the source of the animal sounds that woke me. At first all is quiet out there. Then I see a blur on the horizon and a male ostrich comes into view, flapping his majestic wings. Next to him, the outline of wildebeest moves against the scrubby bush. The sky is turning pink. All I really need to worry about this morning is getting to breakfast and making it on time for the complimentary full-body massage treat that the lodge has booked for me at 11 o’clock. I do some stretches on the wooden deck and my thoughts lazily turn to coffee. 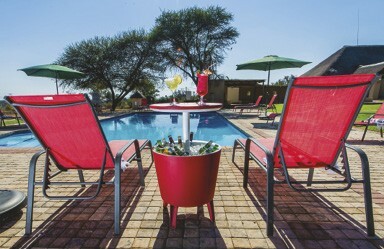 Ritsako Game Lodge is a gem. I have rarely felt so at home in a guest lodge of this kind and I am trying to figure out why. Firstly, it is so easy to get to. I grew up in the bush, and city life, much as I enjoy it, sometimes it gets a bit much for me. Until now though, I often find myself not making the effort to get regular weekends away, mostly because it’s a bit too far to travel for only two nights. Not any more. 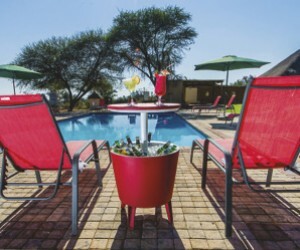 Dinokeng game reserve is less than two hours from Johannesburg, so making the transition from hectic weekday traffic to bush peace and quiet, complete with the free roaming big five, is actually effortless. It’s not just the fact that I am getting my soul soothed by the bush noises and smells, it’s the feeling of peace and quiet. There’s something about Ritsako that is truly relaxing. The lodge is quite big, accommodating 76 guests in a split between self-catering and catered rooms, each with a modern design, tastefully laid out with all the amenities you could wish for. Cool tiles on the floors give a feeling of clean spaciousness. Thick thatch and a palette of greys and browns are highlighted with splashes of red, like the lounge beds that surround two crystal blue pools. It takes more than architecture to make a place feel welcoming though. From the moment you arrive at Ritsako and are presented with a refreshing drink and a warm smile, you feel the family vibe. Having grown up in the tourism industry, I am sensitive to the feeling of reluctance or tension that one so often picks up in establishments, that subtle indication that people are just doing their job, but behind the scenes there are tensions. There is none of that here. On the first night, Jacob our waiter , full of warmth and humour, talks me through the menu, takes our orders and brings both meals and drinks to our room (there’s a rowdy bachelor party going on at the bar). The food is carnivore-friendly soul food, with portions that defeat even my hungry husband and child. “Don’t order the Ritsako burger if you have had any other meal in the day,” they joke. The next day at breakfast I am again struck by an ease and relaxedness to the atmosphere that is not casual or sloppy, just natural and friendly. You feel like inviting people to sit down and join the meal. Later, I learn that Ritsako, one of just over 10 black-owned lodges, out of approximately 120 properties in the area, have a policy of investing in and empowering people locally. “We hire from Hammanskraal and surrounds,” explains Gwen Ncube – Marketing Manager at Ritsako. Sometimes people apply just because they need a job. We then study them, see where their hearts lie, and invest in training them.” Clearly, the staff feel valued, are part of a team and have space to grow. Then, the massage. I know that my back and shoulders are a mess of city tension. Soon I am under the professional and strong hands of a super-skilled massage therapist, melting away the knots, to the sound of a playlist that sends me into deep relaxation. Conferences? Yes, Ritsako is fully kitted out for big groups, whether weddings or work. One large venue caters for 200 delegates, complete with bar, stage and top of the range AV equipment. There is a chapel that doubles as a conferencing room and another conference room with boardrooms and breakaway rooms. I’m happy I am there for relaxing rather than work, but can see that it would be ideal for an annual strat plan, or a conference away from the demands of the office. As for our weekend, it is over way to quickly, and the 7-year old begs me to promise that we will return to Ritsako.